Defense In Depth: It’s always good to have multiple layers of defense, since using any one layer has potential to fail. Therefore, if we have more layers then it is less likely that all the layers fail at same time. This principle should always be kept in mind. Principle of least privilege: As word suggests, each entity should have the least number of privileges which they need to do their job. It helps to limit the damage. There is always need to make sure that users who need access to org only has access. This deals with organization access as a whole. We should make sure that whenever a person leaves a company, then he is de-provisioned. All access should be removed or taken away from him. To remove provision one can freeze user or deactivate them so org access can’t be misused. To remove the mess and for security purposes, we can grant access to users on the basis of their profiles. Also, we can give different permission to each object according to profiles. Field Level Security (FLS) controls the access of fields. While creating profiles assign them the specific set of roles. Now you can provide read access or write access to the objects you want to give access of to that specific profile. Sharing Default: It is a record level access. Public vs. Private: Public refers that if someone has access to all the objects in the org. Then automatically he has access to all the records for that object. The principle is to keep access to private, i.e. 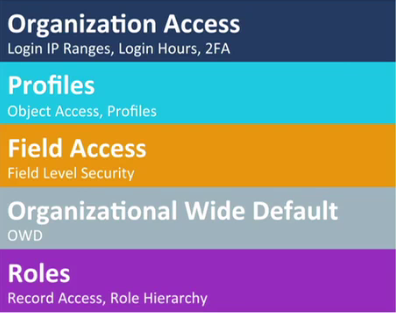 ; a user has access to the objects according to role hierarchy. Internal vs. external: By internal we mean that people who have the direct login to the org and external refer to the people coming through public facing communities, portals or external chatter users. If access is set to public and we have logged in through any portal, then there are high chances of any mishap. Health Check in a way or the other helps you to know the recommendations which Salesforce provides you in general. Many times passwords have proved to be very weak links which can easily be stolen. They act as a single point of failure. They can often be guessable. Some of us have tendency to use the same password for all the accounts which can be fatal sometimes. One can use even Salesforce Authenticator to provide security. This app can be installed quickly. Once user logs in, they have to provide their password and one-time security token that is displayed on the app. This authenticator is not limited to only Salesforce. Hence, 2FA is perfect defense and proves a lot useful when it comes to providing security to the org. By doing so, whenever you log in next time it will not demand any security token. Now it’s a lot to help you, keeping your org safe and secure. Make sure always to follow best practices of defense before you get engrossed and start working. There is always someone who spies and just need that single chance to get all your information. It can be easy for him if you leave any loopholes in between. So please don’t give that single chance to anyone and take precautions before something fatal occurs. BE PROTECTIVE!!!…. Copyright © 2017-18. All Right Reserved.